Card with letterhead of 28 Albert Gate, S.W. [London] 23 April 1890. On letterhead of 8 Kinnaird Road, Withington, Manchester. 25 July 1912. [William Walrond Jackson, Rector of Exeter College, Oxford.] Autograph Letter Signed [to Professor George Frederick Armstrong], explaining the reasons for declining his application for a 'Professorial Fellowship' at Exeter College. On letterhead of Exeter College, Oxford. 24 October 1895. 4pp., 12mo. Bifolium. In good condition, lightly aged. [Hanns Bruno Geinitz, German geologist.] Autograph Letter Signed ('Dr. H. B. Geinitz'), in English, regarding his dealings in Dresden with 'Mr. Pilkington'. 1p., 12mo. In fair condition, somewhat aged and worn. The recipient is not named, but is presumably George Frederick Armstrong (1842-1900), Professor of Engineering, Ediinburgh, from whose family papers the item derives. Geinitz writes: 'With many thanks for your kind letter to introduce Mr. Pilkington. I only regret, that snow and other effects of Winter-time did not allow any trip in the neighborhood [sic] for Geological purposes: we could only spend some days for studies in our Geological Museum, which Mr.
[Lady Beatrice Rochdale and 'the Suffrage Cause'.] Autograph Letter Signed ('Beatrice Rochdale') to 'Mr Armstrong' [radical journalist G. G. Armstrong] regarding the arrangements for a meeting he is giving on the question. On letterhead of Beechwood, Rochdale. 25 February [circa 1912]. The wife of a Liberal MP and author of children's books, Lady Beatrice Rochdale 'spoke, helped at suffrage stalls, etc. ; took part in processions' (see J. Vellacott, 'From Liberal to Labour with Women's Suffrage', 1993). 2pp., 12mo. In good condition, lightly aged. She notes that Armstrong has 'kindly promised to speak at a meeting here on the 6th. of March for the Suffrage Cause', and invites him to 'a meal here either before or after meeting'. She wonders whether it might 'be a help if I sent you back in the Motor'. The letter ends: 'I am afraid we shall not have a very large meeting'. [ J. Edward Jenkins, novelist and Liberal Party politician. ] Autograph Letter Signed ('Edward Jenkins') to Wilhelmina Maria Green, wife of the geologist Alexander Henry Green, explaining why he cannot undertake any more work at present. On lettehead of the House of Commons Library. 19 June 1898. From the papers of the family of the second wife of the geologist Alexander Henry Green (1832-1896), previously Miss Wilhelmina Maria Armstrong of Clifton. 1p., 12mo. In fair condition, lightly aged. Addressed at bottom left to 'Mrs Wilhelmina Armstrong'. The letter opens: 'Dear Madam | I heartily wish I could see my way – but the clouds of work are growing so thick I cannot see each of them - & my elasticity is failing.' He does not dare undertake anything at the present time, but feels 'grateful & flattered by the invitation'. [ Sir Andrew Napier, Irish politician and father-in-law of Dame Nellie Melba. ] Autograph Letter Signed ('Andw. Armstrong') to 'the Reporter of the Globe Newspaper', correcting an error regarding his voting in the House of Commons. House of Commons [ London ]. 8 June 1841. 2pp., 12mo. Bifolium. Addressed on reverse of second leaf 'To the Reporter of the Globe Newspaper'. He points out that in 'the Division which took place last night upon the Belfast and Cave-hill Railway Bill' his name 'was placed in the Majority whereas it should have been in the Minority', and he asks him to correct the error. [ 'John Gawsworth', poet and 'King of Redonda'. ] Corrected Autograph Drafts of ten poems from his collection 'Marlow Hill', including the title poem and the 'suppressed' poem 'Was'. With presentation inscription as 'Abdicated' monarch 'Juan R'..
[ London. ] The poems published in 1941. The presentation inscription dated 16 February 1967. On nine loose 12mo leaves torn from an album. In fair condition, on aged and browned paper. Wrapped by Gawsworth in a larger piece of paper, on the front of which he has written in pencil the presentation inscription: 'Kenilworth | love | from | His King | J R | 16 Feb. 1967', with the following in blue ink over the 'J R': 'Abdicated | Juan R'. 'Marlow Hill' was Gawsworth's fourth collection, self-published by his Richards Press in 1941. Three of the nine leaves carry layouts of the book's title-page and prelims, with pencil notes 'Pubd 15 Oct 1941' and '33 lines to page'. [ 'John Gawsworth', poet and 'King Juan I' of Redonda. ] Typescript of long poem 'The Passions of Juan | (Missives and Missiles)', with autograph emendations and signed note. 9pp., 8vo. In fair condition, on nine leaves of worn and creased paper, the first leaf white, the others green. Minor emendations throughout. The poem is in five sections: 'The Exhortation' (beginning: 'In the crook of my arm | Rest again, nest again. [ Lord Snowdon and Sir Peter Hall. ] Print of photograph of Sir Peter Hall, with stamp of 'Tony Armstrong Jones' on reverse, and Autograph Invoice by Armstrong Jones. Invoice on letterhead of Armstrong Jones Ltd., 20 Pimlico Road, London, SW1. 2 February 1960. Print with stamp from same address, undated. Both items in good condition, with minor signs of age and wear. The black and white photographic print is 24.5 x 19.5 cm, and depicts a chubby Hall, in shirtsleeves and tie, leaning over a seat at the back of a darkened theatre, with a positive look of concentration on his face, as he stares at the stage, a playscript in his hand. The reverse carries two stamps by 'Tony Armstrong Jones, one of them declaring his copyright. Also on the reverse are pencil calculations of dimensions for cropping for publication. Autograph Letter Signed to J. S. Armstrong, President, Commercial Bank of Cincinnati, announcing that the Bank of Kentucky have resolved 'to commence paying Specie'. Louisville, Kentucky. 2 August 1838. 1p., 4to. Good, on lightly-aged paper. He sends 'by the Genl. Pike a package contg P31.563. of our notes for Crt of the Bank of Kenty. | That Bank resolved this morning to commence paying Specie on the 13th Inst'. Hall would himself be President of the Commercial Bank of Cincinnati from 1853 to 1865. Autograph Letter Signed ('Oliver A. Fry') to unnamed male correspondent. 20 April 1898; 141 Portsdown Road, W. [London], on 'Vanity Fair' letterhead. 12mo, 1 p. On first leaf of a bifolium. Text clear and complete. Fair, on aged paper. In reply to the recipient's note, by which he is 'much worried', Fry does not know that he can offer him 'any more than the few short notes <?> for us in "Men & Women of the Times". Little is known about Fry, apart from the fact that he was born in Van Diemen's Land, the son of the Church of England clergyman Henry Phibbs Fry (c.1807-1874). 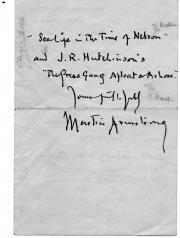 Autograph Letter Signed ('Martin Armstrong') to Thorpe. 15 January 1933; Sutton, Pulborough, Sussex, on cancelled letterhead of 37 Great Ormond Street, London. 12mo, 2 pp. Good, on lightly-aged and creased paper. Giving the details of three titles from Thorp's 'large catalogue' which he hopes are still available (one is ticked in pencil and the other two marked as sold). 'Also can you let me have a cheap copy of John Masefield's "Sea Life in The Time of Nelson" and J. R. Hutchinson's "The Press Gang Afloat & Ashore." Publishers and prices of both items are noted in pencil, with 'Cheque Noted' in margin. Two Autograph Letters Signed and one Typed Letter Signed (all three 'A. W. Pimm') on 'loco matters' to King. 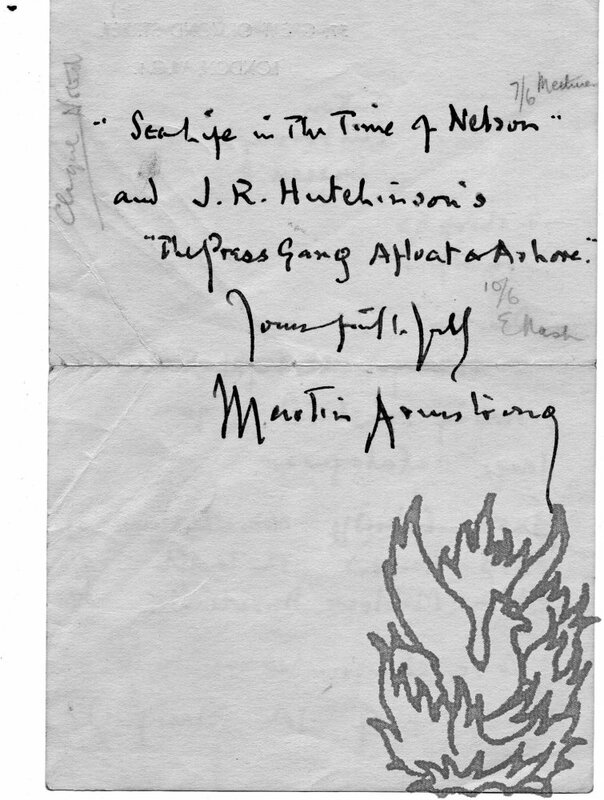 Autograph Letters: 14 October and 18 December 1942. Typed Letter: 4 November 1942. All three from 5 Oakhill Road, Orpington, Kent. Text of all three letters clear and entire. A well-written and well-informed correspondence relating to 'locomotive matters'. Letter One (14 October 1942): Manuscript. Foolscap, 4 pp. Good, on aged high-acidity paper. 'Knowing, and to some extent, at least, sharing' King's 'interest in loco matters', Pimm informs him that the Ministry of Supply 'have ordered 360 L.M.S. mixed traffics generally like the 227 that AW's [Armstrong Whitworth] bill as their last order'. Five Autograph Letters Signed and one Typed Letter Signed to G. K. Menzies, Secretary, Royal Society of Arts. British railway magnate and industrialist in India (1862-1949). The collection is very good. The five autograph letters are 12mo, and printed on letterheads. All items signed 'C H Armstrong'. Several items docketed and bearing the Society's stamp. Mainly concerned with Society committee matters, but two letters of interest. The first (autograph, 15 February 1928, 2 pages, 12mo): 'You will no doubt have seen the remarks of the Lord Chief Justice in the Mitchell Hedges case - Times of 14 inst page 5 column 2 - on "learned societies . . . .
Eleven Typed Letters Signed and one Autograph Letter Signed, variously to W. Perry and G. F. Menzies, Royal Society of Arts; and three-page typed 'brief statement of Dr. [Charles] Carpenter's qualifications', headed 'CONFIDENTIAL'. 1927 to 1934; on letterheads including 'BUSH HOUSE, | ALDWYCH', 'BALDWIN HOUSE, | 67, QUEEN VICTORIA STREET', and that of the British Dyestuffs Corporation Ltd.
British chemist (1878-1945), Vice-President of the Royal Society, 1942-3. All items in very good condition. All letters, one page, quarto. Subjects include an R.S.A. lecture by Armstrong on 'Hydrogen and its uses', the proof of another lecture, Armstrong's chairmanship of various R.S.A. meetings, his appointment as R.S.A. Vice-President, and the possibility of a 'paper on the hydrogenation of bituminous coal ('even though a good many people may be a little tired of the subject'): 'I suppose the man you ought to ask in the first place is K.
Four Typed Notes Signed to the Secretary, Royal Society of Arts and the editor of the R.S.A. Journal. 21 October, 21 November and 9 December 1927; 1 May 1929; all on Royal Automobile Club letterhead. General manager of the Royal Automobile Club (1871-1944). All four items one page, quarto. All four in good condition and signed 'F. P. Armstrong'. All four docketed and two bearing R.S.A. stamp. Note one asks for '100 stamped envelopes' for sending to 'Members of the Committee and others who would be interested in the papers that are to be read before the Royal Society'. Note two thanks the editor of the R.S.A. Journal for the 'copies of Mr. O'Gorman's paper'. Typed Letter Signed to Sir Henry T[rueman]. Wood[, Secretary, Royal Society of Arts]. Journalist (1855-1931), editor of Vanity Fair, 1889-1904. One page, quarto. Very good, if a little dusty. Docketed and bearing R.S.A. stamp. There is 'no apparent chance' of F. V. Brookes delivering his 'promised lecture' at the R.S.A. 'Of course I would be willing if necessary to read this paper for my old friend; but [...] I would very strongly urge that it would be better in every way to postpone this lecture for some time. Its subject is one that is peculiarly Mr. Brooks's own, and I think no one else would deal with it so well.' Signed 'Oliver A. Fry'.